Journal Reference: Zheng Y, D Rosenfeld, and Z Li. 2018. "The Relationships Between Cloud Top Radiative Cooling Rates, Surface Latent Heat Fluxes, and Cloud-Base Heights in Marine Stratocumulus." Journal of Geophysical Research: Atmospheres, 123(20), 10.1029/2018JD028579. Example cases of single‐layer (left panel) and cumulus‐fed stratocumulus (right panel). (a and b) Time‐height plots of cloud radar reflectivity. (c and d) Probability density function of ceilometer‐derived cloud‐base heights. (e and f) 2‐D view of the GOES‐derived liquid water path. (g and h) Probability density function of GOES‐derived cloud geometrical thickness. Co-variabilities between cloud-top radiative cooling (red) and surface latent heat fluxes (blue) in conditions of weak (left) and strong (right) inversion capping the clouds. Everything cools radiatively. This study investigates how the cooling of oceanic low clouds drives their physical properties including (1) the bases of clouds, (2) surface energy fluxes, and (3) their coupling with sea surfaces. This study highlights the need to devote more effort to understanding a climatologically important but poorly understood cloud regime: cumulus-fed stratocumulus clouds. We stress the importance of low-level temperature advection in understanding this specific cloud regime. This study examines the role of cloud top radiative cooling (CTRC) in regulating the surface‐cloud coupling, surface latent heat fluxes, and cloud base height by exploiting six months' worth of shipborne observations over the subtropical northeast Pacific in combination with geostationary satellite data. 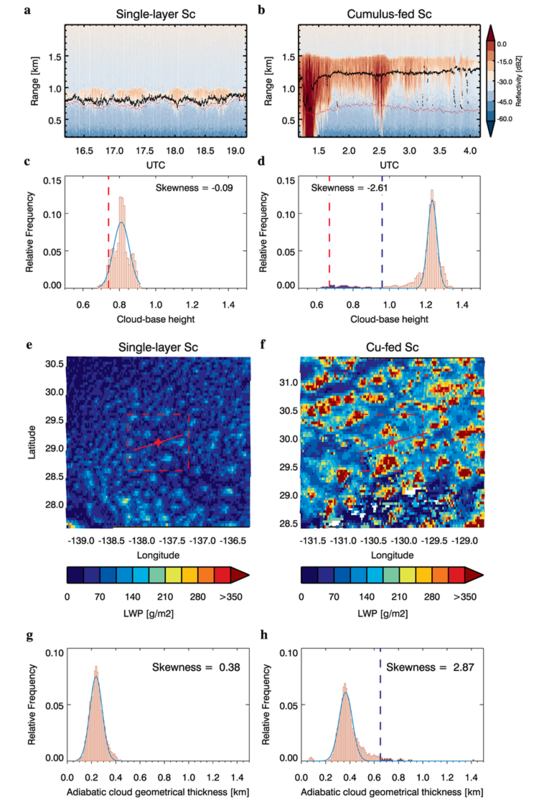 We find that owing to the prevailing equatorward flow that advects stratocumulus clouds over warmer sea surfaces, the vast majority of the decoupled stratocumulus decks are fed by divergence from the tops of underlying cumulus, forming cumulus‐coupled MBL. The cumulus‐coupled and well‐mixed MBL dominate the subtropical MBL regimes. We find that strong CTRC favors greater (smaller) occurrence frequency of well‐mixed (cumulus‐coupled) MBLs. In well‐mixed MBLs, strong CTRC enhances entrainment of dry free‐tropospheric air, desiccates the MBL, increases the surface latent heat fluxes, and elevates the cloud‐base height. This is demonstrated by the observed covariabilities between the CTRC rate and surface latent heat fluxes and cloud‐base height. The relationships are more statistically significant in conditions where the inversion strength is relatively weak, and thus, the entrainment is more effective. In cumulus‐coupled MBLs, however, the influence of CTRC in regulating the surface moisture is not detected by the ship observations. 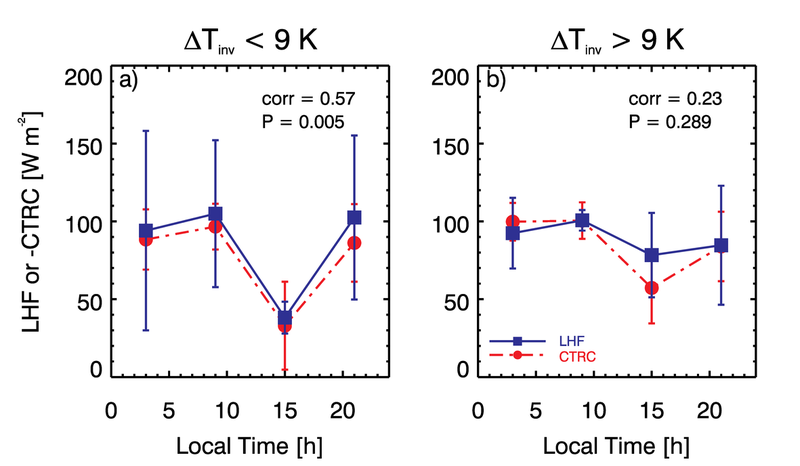 Latent heat fluxes much greater than the CTRC rate in cumulus‐coupled MBLs suggest stronger surface forcing, which substantially tames the footprint of CTRC.